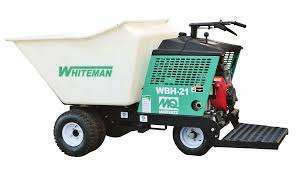 The Whiteman-Multiquip WBH-16EAWD Power Buggy with a Vanguard 18HP with Electric Start and All Wheel Drive version is the most all purpose buggy on the market. The Whiteman-Multiquip TB11E TuffTruk is ideal for interior demolition, environmental remediation, general construction, landscaping and utility work. The Whiteman-Multiquip TB11G TuffTruk is ideal for interior demolition, environmental remediation, general construction, landscaping and utility work.